A. The prison cells dedicated to solitary confinement in the famous Alcatraz penitentiary. B. Portion of the periodic table which contains the element groups 3-12. C. A new art project space in Long Beach, California. If you answered “C” you would be correct! D-Block is a new experimental project space supporting both artists and curators. We welcome proposals for exhibitions that challenge traditional gallery/museum art presentation. D-Block is not a traditional “white cube” gallery but is instead broken into a dual space with both concrete and dirt floors. The material makeup of the exposed dirt foundation and concrete floor creates a dichotomy of materials and states of construction that allows for alternative exhibition practices and interrogations of space. While D-Block cannot fund projects financially we can provide an exhibition space for your ideas and support your project in non-monetary ways. 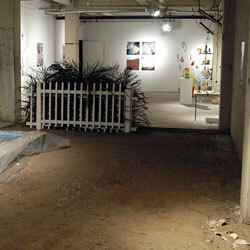 D-Block’s current exhibition space at 218 N Promenade was generously provided by Phantom Galleries Long Beach. Visiting D-Block? Please refer to our Contact page.